Welcome to the Home Page of the Hudson Fire Department. The Department is located in the centre of the Town of Hudson at 523 Main Road. We share the building with the Hudson Police Department who act as our dispatchers. The Hudson Fire Department provides 24 hour fire, rescue and first responder medical services for the community. The Department consists of four Officers and nineteen firefighters. The volunteer/paid-on-call firefighters and officers all carry pagers that can alert them of an emergency call. The members of the "Rescue 7 Medical team" also carry two way radios as do the four officers. More on that later. 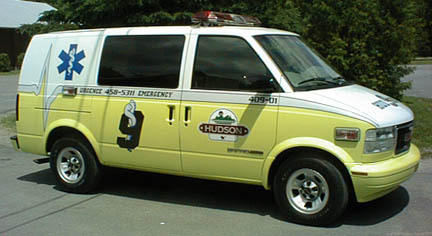 The Hudson Fire Department is an active member of the Vaudreuil County Mutual Aid system. Help can be called from surrounding municipal Fire Departments in the case of a serious fire emergency. The Vaudreuil County Mutual Aid system consists of volunteer paid on call fire departments from the following towns and municipalities; Ile Perrot, Terrasse Vaudreuil, Vaudreuil-Dorion, Saint Lazare, Les Cedres, Hudson, Pointe des Cascades, Ste Marthe and Rigaud. On February 18th, 1997 Hudson called on help from the Rigaud and Vaudreuil/Dorion Fire Departments to help battle a major structure fire that destroyed a large hardware warehouse in the centre of Hudson. Each outside department, when called on for help is asked to send a pumper and at least 6 firefighters. Then on Monday, November 3rd, 1997, Hudson's Engine 6 and six firefighters responded to a major fire in the Town of Rigaud, nines miles west of Hudson. An abandoned COOP warehouse and flour mill was fully involved in flames. Rigaud also called on St. Lazare and Vaudreuil-Dorion for help. Vaudreuil-Dorion's new aerial ladder had its first real workout battling a fire. The volunteers of the Hudson Fire Department had a rather rough time during early January during the massive ice storm. The men and women of the Department responded to over 200 calls during the two weeks that the ice storm left Hudson without electricity. In 1997 the department responded to 220 calls! Many responses were for wires down, branch clearing and smoke in homes. Luckily Hudson only experienced two major house fires. Neighbouring Towns like St. Lazare and Rigaud were not so fortunate. The HFD had to handle 7 mutual aid calls during the storm, heading out to Rigaud and St. Lazare. It was a tough time but the men and women proved that they truly are Hudson's Bravest! Hudson's new First Responder Unit. It is not a replacement for Rescue 7 but a smaller more useful unit to respond to medical emergencies in Hudson thus freeing up Rescue 7 for more fire related operations.